“International Journal for Research”, ISSN 2348-6848 is peer-reviewed, open access print and online journal providing a publication vehicle for complete coverage of all topics of interest to those involved in the engineering and technology areas.The audience includes researchers, students, manager of IT companies as well as scientists around the world. The Editorial Board will consider any material related to computer science areas for publication that is of interest to those groups. The journal publishes high-quality, refereed articles. It emphasizes a balanced coverage of both theory and practice. 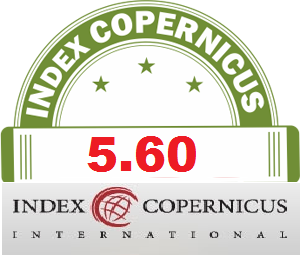 It fully acknowledges and vividly promotes a breadth of the discipline of Computer Sciences. The primary purpose of the journal is to publish original and complete papers covering a specific topic or project in fields of Computer Science in sufficient detail and depth to be of practical use to interested readers. The readers should benefit from the novel solutions and analyses presented in the papers. Enhanced, extended versions of quality papers presented at conferences or workshops can be submitted to our journal for review. Easy and Transparent paper publication process. IJR provides Paper Hard Copy free of cost(Only Special Issues). To maintain a high-quality journal, manuscripts that appear in the IJR Articles section have been subjected to a strict three stage review process. This includes reviews by one or more members of the review board, followed by a detailed review by the IJR editors. 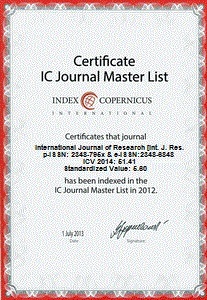 “IJR” is steered by a prestigious Board of Editors and is supported by an international review board committee consisting of individuals representing many well-known universities, colleges, and corporations in the India, United and many more countries.The topics covered by the journal but not limited to these are, Communication Network Architectures, Communication Network Protocols, Network Services and Applications, Network Security and Privacy, Complexity theory, Algorithmic Complexity, Parallel & distributed computing, Computer networks, Neural networks, Computational learning theory, Database theory & practice, Database, Operating Systems, Wireless Sensor Networks, Theory of algorithm, Formal languages, Automata theory, Cloud Computing, Grid Computing, Distributed Computing, Data Compression & Security, Data Structures and Algorithms Data Mining, Data Retrieval, Decision making, Open Source Tools, Bioinformatics, Software Engineering, Artificial Intelligence , Compiler Design, Computer Graphics and many more.